A small pair creates big trouble in this hand from the 2016 $111,111 High Roller for One Drop. A hand from the $111,111 High Roller for One Drop shows the trouble that small pairs can cause. This week's hand comes from the biggest event from this summer's World Series of Poker, when it comes to the buy-in at least. It's the $111,111 High Roller for One Drop, with nearly $5 million up top, and the final table had been reached when this hand went down with eight players left. 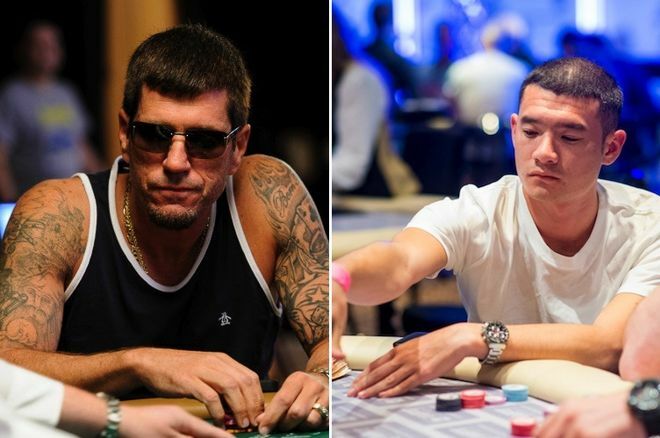 A number of the most feared names in poker, including Fedor Holz, Dan Smith, and Joe McKeehen, had advanced to the final table. But the true wild card of the bunch was Brian Green, who still had north of $400,000 in WSOP cashes but was without the big-time nosebleed experience of his opponents. Green is the one tangling with Jack Salter in our highlighted hand. Blinds were 120,000/240,000 with an ante of 40,000. Niall Farrell — the star of another hand in this series — opened from the cutoff for 550,000 with . Green flat-called on the button with , then Jack Salter woke up with in the big blind. Sitting on a stack of about 9.2 million, Salter made it 2,020,000 to go. Farrell mucked but Green, who started the hand with about 17 million, called the reraise. The flop came , and Salter bet 1,375,000. Green stuck around with a call, and the pair saw the fall on the turn. Salter quickly shoved all in for 6,040,000, and Green went into the tank for a few minutes before mucking. The tougher my opponents are, the less likely I am to get involved in pots with small pairs — and this hand really illustrates why. Preflop, flatting a raise in position with relatively deep stacks is probably okay, but even then it's usually going to be tough to get a ton of value against good players unless a perfect scenario arises in which you flop a set while an opponent flops top pair or has an overpair and the board stays fairly dry. When the squeeze comes from Salter in the big blind, Farrell ducks out of the way and leaves Green to choose between giving up the pot or continuing with a very mediocre hand. He decides to see the flop, despite having to call 1.5 million with only about another 7 million back. Green gets one of the best flops possible that doesn't bring a set as the board means whoever started with the best hand likely still has the best hand. Green knows there's a good chance he's best, but what can he really do when Salter bets 1,375,000? Raising would define his hand immediately, but doing so would simply serve to chase away the stuff he has beat and isolate him against the overpairs he's losing against. This is why playing these hands is nearly impossible postflop against capable players. If you're ahead, your hand is extremely vulnerable, and if you're behind, you have almost no way of winning the pot. There really aren't any good options, and Salter shows why when he jams the turn after the queen falls. He can just as easily have ace-queen as ace-king, and Green has to decide between hero-calling and possibly having almost no equity in a massive pot for half of his chips or preserving his standing as one of the bigger stacks by folding. Green decides to give up the pot, folding the best hand in the process. Green wasn't getting good odds to try and set mine, but he still ended up folding on one of the best boards possible. Small pairs are hands with very little maneuverability postflop, and Green got stuck playing his hand face-up without any good options.